We’d love your help. Let us know what’s wrong with this preview of 52, Book 1 by Grant Morrison. Following the events of INFINITE CRISIS, the Big Three of the DC Universe each took a year away from their superhero duties. It was a year without Superman, a year without Batman, a year without Wonder Woman, a year without the Justice League. But it wasn't a year without heroes. Geoff Johns, Grant Morrison, Greg Rucka and Mark Waid pen the weekly, yearlong series that red Following the events of INFINITE CRISIS, the Big Three of the DC Universe each took a year away from their superhero duties. It was a year without Superman, a year without Batman, a year without Wonder Woman, a year without the Justice League. But it wasn't a year without heroes. Geoff Johns, Grant Morrison, Greg Rucka and Mark Waid pen the weekly, yearlong series that redefined not only the DC Universe but what exactly it means to be a hero. To ask other readers questions about 52, Book 1, please sign up. This comic book was very interesting. Happy to see all the comic book characters in the book. Wonder if Ralph will become Dr. Fate. Black Adam seems interesting. Hope he will have fun with his new family. Hope Renee and Charlie will be able to stop Intergang. Wondering when Renee and Kate will talk. Hope Batman and Wonder Woman come back. Also hope Superman does too. The Good: The artwork here is amazing! The amount of detail put into the characters and locations blew me away. I was impressed by how convoluted the story was; it has plenty of twists and turns, and definitely kept me involved! The Bad: As usual for more modern comics, there was quite a bit of unnecessary content. A serious overuse of profanity was present, ranging from d-words and h-words to various b-words, including the British crudity "b---er," to even symbols ("#^($@") used to imply even wo The Good: The artwork here is amazing! The amount of detail put into the characters and locations blew me away. I was impressed by how convoluted the story was; it has plenty of twists and turns, and definitely kept me involved! The Bad: As usual for more modern comics, there was quite a bit of unnecessary content. A serious overuse of profanity was present, ranging from d-words and h-words to various b-words, including the British crudity "b---er," to even symbols ("#^($@") used to imply even worse words. The violence was also bloody at times, and some of the monsters--particularly a hideous egg creature--were rather scary. Also, there was a bit of sultriness; the bit where two women were seen in bed together in their underwear was completely unnecessary. To pool a great team of writers like this together and have them creating a coherent but multi-faceted storyline that allows some of the other DC regulars to step into the shoes of the Trinity...really good stuff here, not surprising as DC's crossover events generally have a high benchmark for depth and quality. I never thought I'd miss Batman, Wonder Woman and Superman (in that order) so much. This was an interesting read since I don't know much of the DC world, and the best known ones were absent or minimally involved here. I think I just enjoy binge-reading comic books. It's 52. This is the story that was so great that it permanent established the number 52 being so important in the DC universe. It begins the story that humanizes Black Adam. It has the tragedy of Booster Gold. It gave the Question a brilliant mystery for him to solve. It gave Batwoman her lesbianism (the only thing she has resembling a character trait). It's also a great value for the first 26 issues of the series. One journey ends but another begins. After the epic that was the Infinite Crisis, the DC Comics Universe slides into an interesting set of stories in what ends up being a year of transition from the event, several superheroes have been killed others survive and some have simply gone missing. Superman had defeated an alternate version of himself by throwing himself and his foe into a red sun that ended up taking away their powers. It may only be temporary but its pretty clear that Superman is gon One journey ends but another begins. After the epic that was the Infinite Crisis, the DC Comics Universe slides into an interesting set of stories in what ends up being a year of transition from the event, several superheroes have been killed others survive and some have simply gone missing. Superman had defeated an alternate version of himself by throwing himself and his foe into a red sun that ended up taking away their powers. It may only be temporary but its pretty clear that Superman is gone. Batman after being caught up in learning that his memories were erased, nearly being killed by a mind-controlled Superman and an intelligence that he created to protect the world was used against himself and his friends that its time to call it quits. Wonder Woman believes she has let down others in her role as an ambassador to the world of men. The DC Trinity calls it quits as the Justice League reforms without its greatest leaders in charge. This collection makes it clear that the world keeps on spinning without them as certain series of events come together for several heroes and villains. 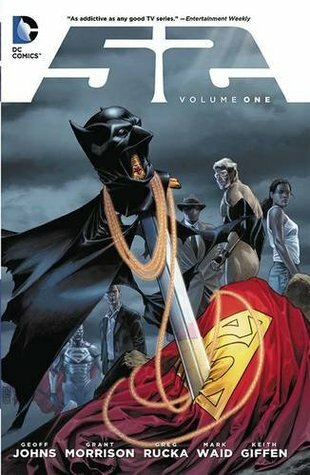 Several characters with major storylines in this collection set the tempo for DC Universe. Booster Gold is caught up in attempting to be his usual showboating self with sponsorships and the occasional daring do. But it would appear somebody else is out to take his spotlight. Is Superman back but in a new costume? Or is it something else. It turns out to be even more surprising as Booster Gold attempts to discover this strange new mystery. Lex Luthor is apparently creating his own version of superheroes. The Everyman Project in which years of researching ways to destroy Superman has lead him to grant powers to ordinary men and women for the good of a Metropolis without a Superman. Apparently looking to become one of these Everyman is Natasha Irons, the niece of John Henry Irons aka Steel. My favorite of the Everyman Project is a young girl named Eliza Harmon aka Trajectory. Something really cool about a female speedster. Ralph Dibney and Cassandra Sandsmark still grieve for their lost loved ones after the events of Identity Crisis and Infinite Crisis. Hope seems to be on the horizon for both as Ralph learns of a way to enter a realm in order to see his wife Sue and Cassie believes that there is a secret as far as Conner is concerned. The Metal Men seem to be involved in some matter in Asia. While Renee Montoya encounters an interesting hero utilizing a strange mask calling himself The Question, leading to Kandaq where things really develop for Black Adam. Black Adam falls in love with a woman called Adrianna Tomaz who’s possessed by the powers of a being called Isis. Along with her brother Anon who becomes Osiris. This along with a new ally leads Black Adam to a state of joy. Starfire, Adam Strange and Buddy Baker aka Animal Man seemed to have encountered a problem after the events of Infinite Crisis as they attempt to return back home. I got to say reading the first half of this year-long collection was a bit of a challenge but it was fun in many respects. Still a part of me kind of wishes these stories weren’t combined. The only thing that these stories had in common was that it was a world without the DC Trinity. Booster Gold’s story was pretty neat and The Everyman Project does look neat too. It was great seeing how other heroes like the Justice League and Teen Titans dealt with the events after Infinite Crisis. Nice bit with the Superboy resurrection cult. Didn’t really like Renee Montoya, knowing her only from the Batman animated series I wasn’t exactly happy with her in the comics. Unlike The Question whom I loved watching in the Justice League animated series. Got to say reading up on Black Adam was a surprise. I don’t really sympathize a lot with Black Adam but this was really nice. Unfortunately, you can pretty much guess that something bad is about to happen, just how bad is the real question.